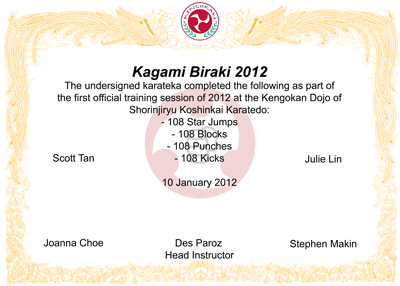 Tonight marked the first official training session of 2012 for the Kengokan Dojo. Following the Japanese traditions, this session was our Kagami Biraki session. As discussed in the New Years Greetings post, Kagami Biraki means opening the mirror, and symbolises the introspection associated with the New Years period in most cultures, and also the end of the New Years festivities, and the “getting-on-with-it” of training. Additionally, all participants (mudansha and yudansha, including instructors) made a demonstration. We saw the following kata: Naihanchin Sho, Happiken, Nijushiho, Kusanku Sho and Kusanku Dai. Well done to all participants. It was a good start to our training year. At the end of the session, a special presentation of an Achievement Award for 2011 was made to Sensei Joanna. Having been promoted to 1st Dan in 2011, Sensei Jo’s achievements over the past few years have been outstanding. Congratulations to Sensei Joanna.